Its not very satisfying to read romanticized biographies of inventors and geniuses such as Edison and Rudolf Diesel. These works tend to completely ignore the group-think, group creativity in solving practical problems. The coffee place banter and irrational elements that may have led from one idea to the other to the final solution is an often missing element. In-fact, after reading a certain in-depth biography of Diesel by Grosser, I was convinced that Diesel's assistant who toiled with him to build, test and repair the first working prototypes of the diesel engine must have been a similar genius as Rudolf. If it weren't for this vital collaboration of two minds, we'd have been short of the diesel engine for a few years, perhaps even a decade into the early 20th century. These subtle and important details are left behind in romanticized books about the "lone-inventor genius" who one sunny morning chances upon an important idea that changes the world. On a related note, I casually began reading a very interesting classic text on Synectics written by inventor and psychologist William J. Gordon. It was the first book of its kind that put forth an operational theory of creativity, extracted from numerous tape recorded group experiments in vivo, i.e, as they happened, which gave new insight into the underlying psychological factors at work in the formation of new, workable ideas. The need for an operational theory is to increase the probability of success in problem stating, problem solving in technical groups. The idea is that a "Synectic" group can be more powerful than an individual acting alone to generate ideas. This study of the creative process to extract some hypothesis about the process is based on the assumption that the very process of examining a group of individuals in creative action will not demolish the creative process. 3. it is these emotional, irrational elements which can and must be understood in order to increase the probability of success in a problem-solving situation. Traditional design philosophies in engineering pontificate a step-by-step schematic of design and problem solving. The first step is to state the problem. Then you understand the constraints. Next, you brainstorm multiple alternatives that are workable. Last, you optimize and select the best one on a figure of merit, such as cost, efficiency, weight, etc. 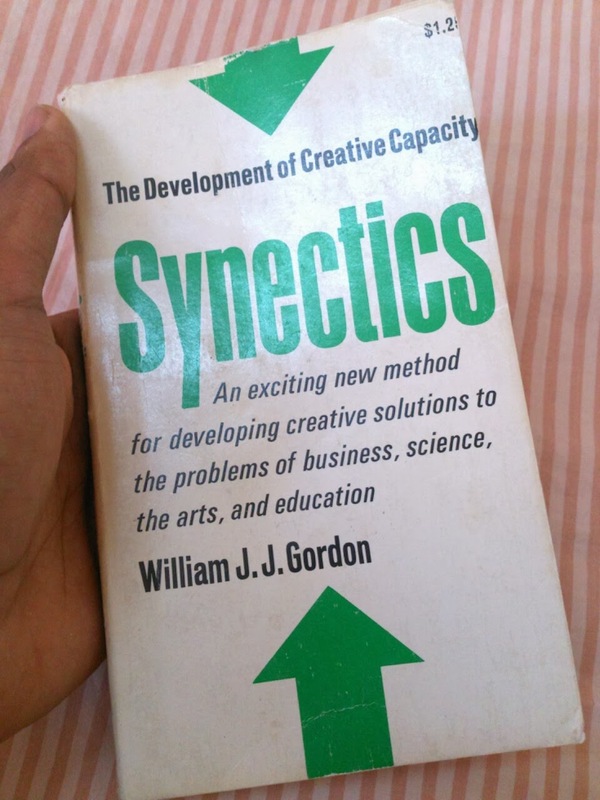 Synectics is particularly interesting because it lays the groundwork for employing psychological mechanisms for problem solving. Its a deliberate sequence of steps to maximize group-think time instead of going around in circles. Consider problems such as the need to invent a new, elegant and practical constant speed mechanism. Or a new jacking mechanism that should fit within certain limited dimensions yet be able to lift 4 tons. Or a novel can opener mechanism. The carefully chosen Synectics design group, comprising of a group of people with diverse backgrounds and child-like qualities, then takes them apart and start looking at them differently. They could lose themselves for a few hours and make the problem strange, describe it in their own words, using analogies and metaphors to attack it. Its purposeful banter. Its fun. There is an accident in this banter that is waiting to happen, an accident that could yield the next best solution. There is a heavy play of irrational elements, not as an end to themselves, but having a purpose to come up with new solutions. You have to dislodge your mind out of the laws of physics for brief moments and start to look at problems in new ways to gain new perspectives. With your compatriots, you form associations with other branches of knowledge. These mechanisms of employing Synectics are validated. For instance, one mechanism of making associations, called Direct Analogy, took its course during the invention of tetraethyl lead. A passage from T.A Boyd's biography of C.F Kettering wrote thus : "Speculating then on why kerosene knocked worse than gasoline, as it was known to do, the two men reasoned that it might be because kerosene did not vaporize as readily as gasoline. They recalled that the wild flower, the trailing arbutus, with its red-backed leaves, blossoms early in spring, even under the snow. If only kerosene were dyed red, they speculated, it might - like the leaves of the trailing arbutus - absorb heat faster, and so vaporize quickly enough to burn in the engine like gasoline." What did a flower have to do with Tetra-Ethyl lead? Synectics research is concerned with the idea that you can select a group of individuals carefully and train them in such a way as to employ psychological mechanisms and apparent irrelevancies to unearth new perspectives and solutions. This Synectics group can be a dedicated design team in a corporate or industrial setting, setting up a program akin to Lockeed's Skunkworks, working off-hours in a dedicated meeting quarters complete with its own shop and lab facilities and immune from bureaucracy. Sounds like a whole lot of fun! Like the introduction of any program such as Six Sigma, companies looking to avail Synectics to evoke new technical ideas should consult Synectics experts such as this one. And don't miss out on the book I mentioned either.